Do you remember when the first T.G.I. Fridays opened in Manila? I do. 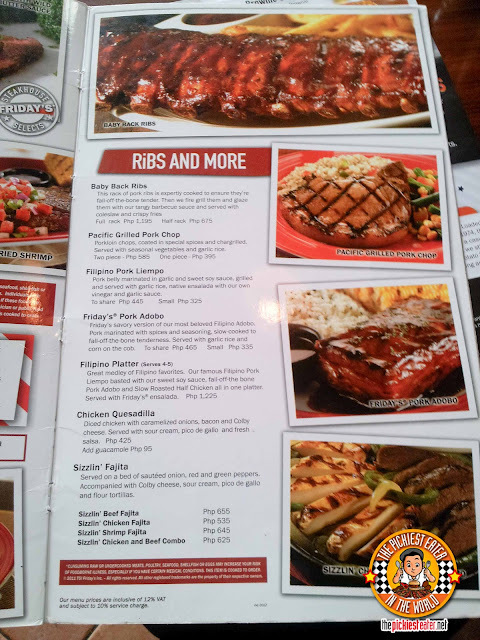 All of a sudden, when it came to dining out in Makati, T.G.I. Fridays became THE default choice of everyone. The line to get in was ridiculous. You would think that the Filipino people were once again holding a "People Power" rally to overthrow an evil dictatorship at the third floor of Glorietta 2. You'd never think that all these people would wait hours in line for some chicken fingers and burgers. Whether you were with your friends or family, it mattered not. Forget Cindy's. T.G.I.Friday's was the place to be. 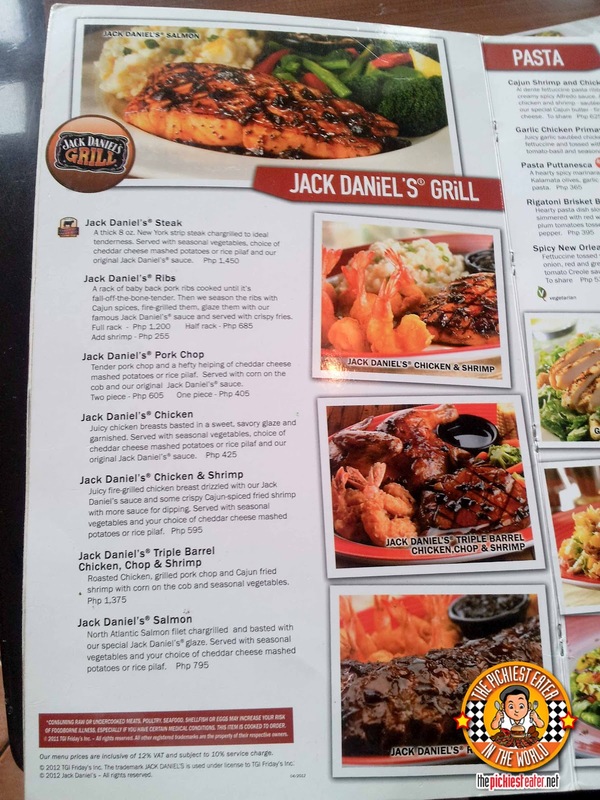 Even though they now have 11 branches in the Philippines, spanning as far as Cebu, Fridays STILL gets jammed packed, especially in the evenings. You'd be hard pressed to find a place that invokes as much "fun" as T.G.I. Friday's. 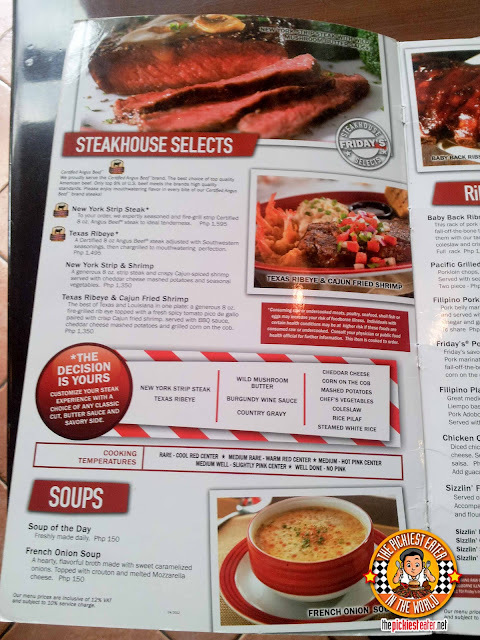 It became a favorite place to celebrate among Birthday Celebrants, mainly because of how the servers bust out into song when they serve you your cake. 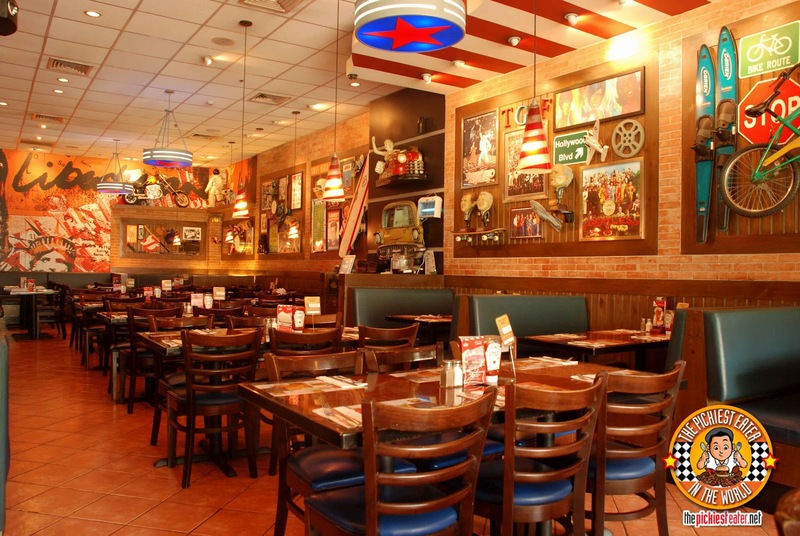 T.G.I.Friday's looks sort of like a British Pub, but with the energy much more electric. From the zany costumes of their servers (which often includes flamboyant headgear), to the fascinating memorabilia that adorn their walls, your Friday's experience is sure to be a memorable one. 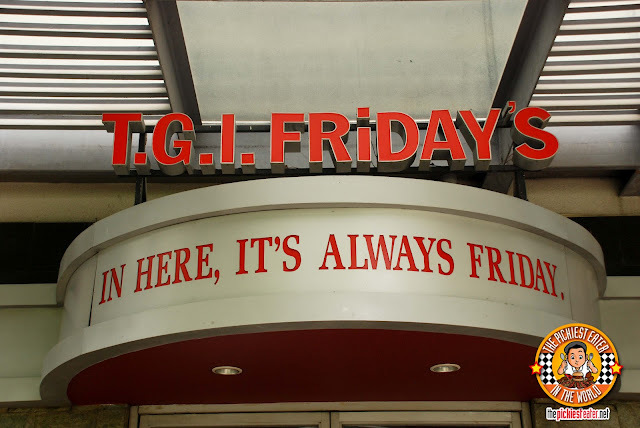 My most recent T.G.I.Friday's was no different. In fact, is was one of the most memorable experiences of my entire life. 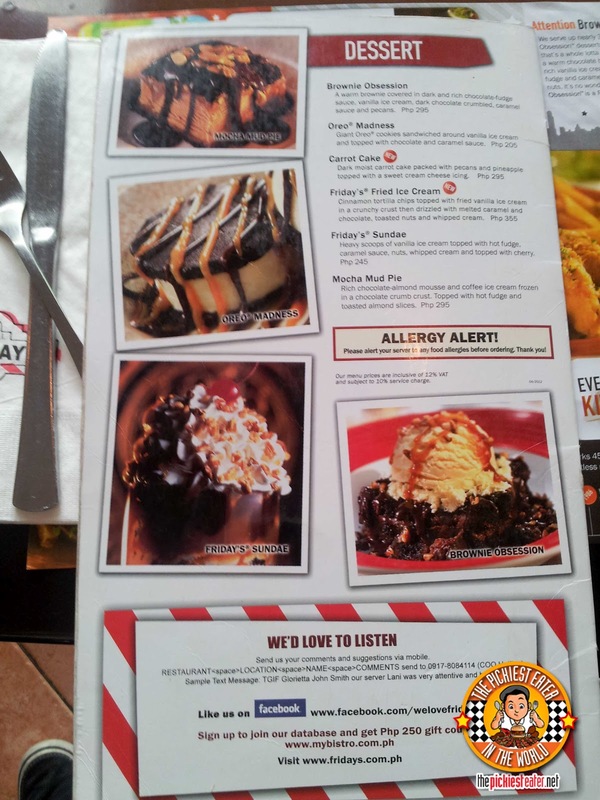 T.G.I.Fridays was the place where I met up with the people from Oreo Philippines, when they invited me to participate in becoming the "Official Blogger Ambassadoreo". Perhaps one of T.G.I. 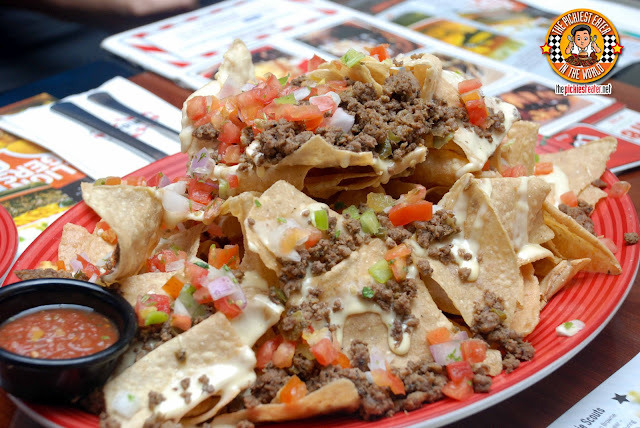 Friday's trademark dishes, is their Ballpark Nachos (P495), which is a favorite among huge groups because of its sheer enormity. While I was here, I took a picture of this with my phone's cam and posted it to The Pickiest Eater Facebook Page, and the people went nuts! You're given a large, almost majestic platter, of what I could only describe as, "The Mount Everest of Nachos". The crispy corn chips are topped off with bits of tomato, ground beef, and drizzled with sour cream, and served with a side of Salsa. Perfect finger food.. I don't drink beer (Or any form of alcohol for that matter), but I could see why this is a favorite "Pulutan". 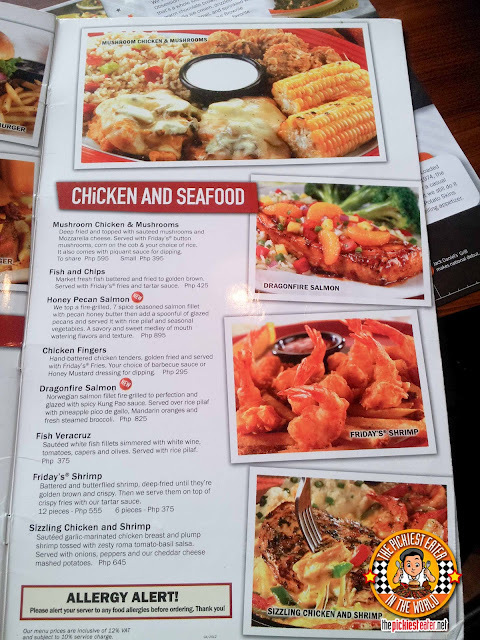 Friday's Buffalo Wings (6pcs P295/ 12pcs P485) has that tanginess that Buffalo wing lovers can't get enough of. 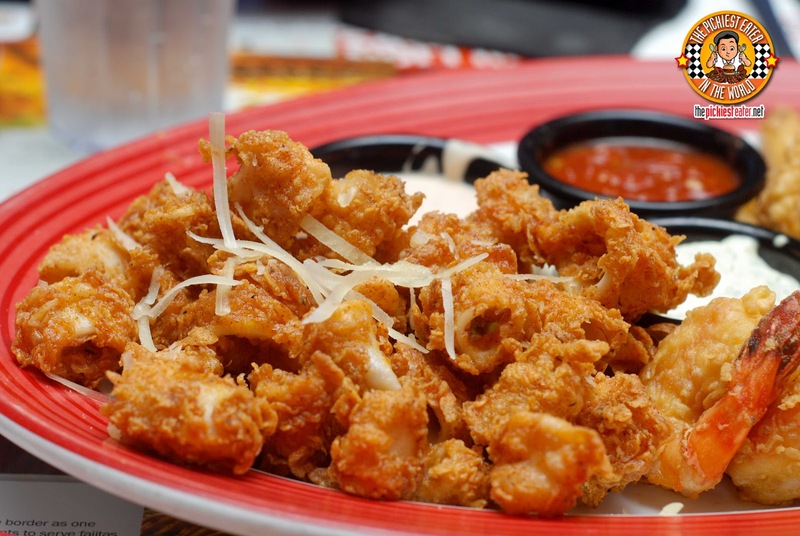 The strong acid is tempered by the Blue cheese dip that accompanies the dish, and the spiciness isn't too overpowering. 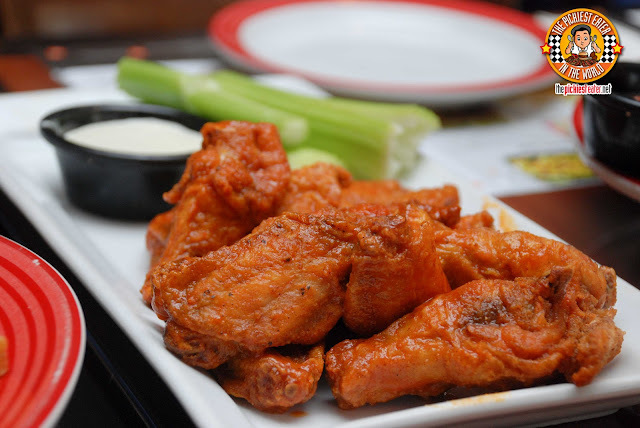 Personally though, I'm not too big on Buffalo wings, but my companions couldn't get enough of the stuff. Another glorious platter of T.G.I. 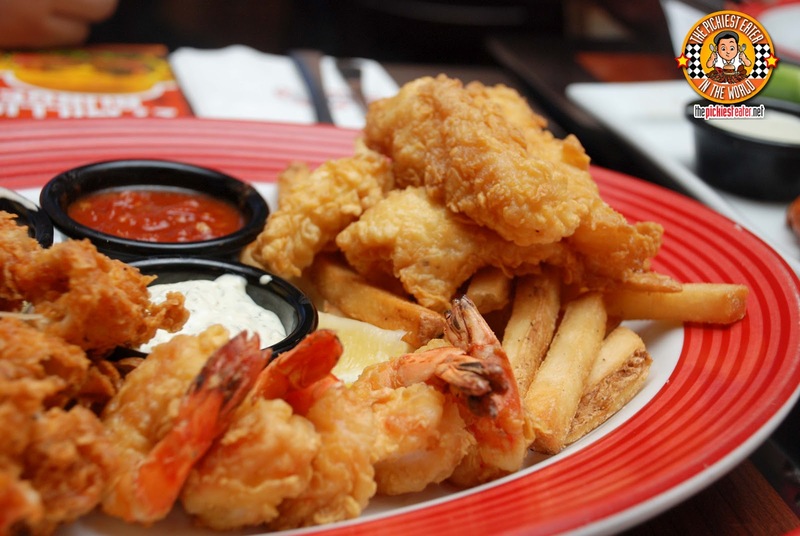 Friday's is their Seafood Platter (P955). As evidenced by my trip to Fish & Co., I have no problem eating fish. 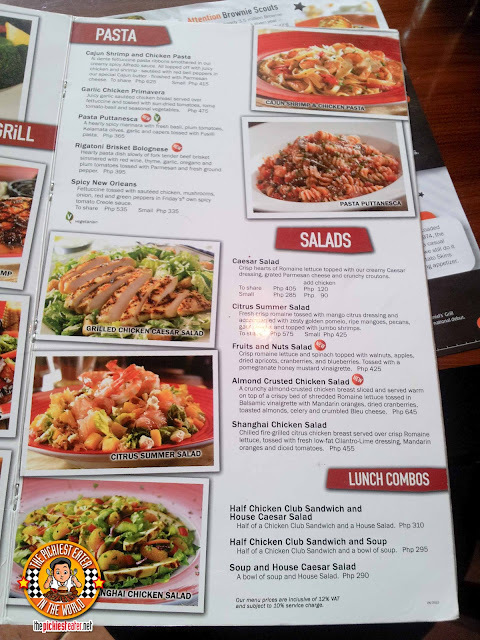 What i'm not too fond of, is squid and shrimp. But Friday's Seafood platter is a whole new ball game. I could not stop popping the little Calamares rings into my mouth as I was carrying on a conversation with my companions. Naturally, I was doing it as nonchalantly as possible so that by the time our conversation had ended and they wondered who finished all the calamares, I wouldn't be the culprit. Since I'm not a fan of squid meat, I find that the beauty of Friday's calamares is in their bread coating. It's light enough to not overpower the squid, yet holds together beautifully to make a beautiful crunch with every bite. Between the three sauces, The cocktail sauce, the Tartar, and the Southwestern Sour Cream, for me, this went perfectly with the Sour Cream. The white fish fillet was also a beautifully cooked, crispy fish fillet. Though it was clearly notches below the excellence of Fish and Co.'s "Best Fish and Chips In Town", it's still definitely something worth trying. This paired perfectly with the tartar sauce. The shrimp for me, was the weakest among the components, but that is more due to my aversion to shrimp than anything else. 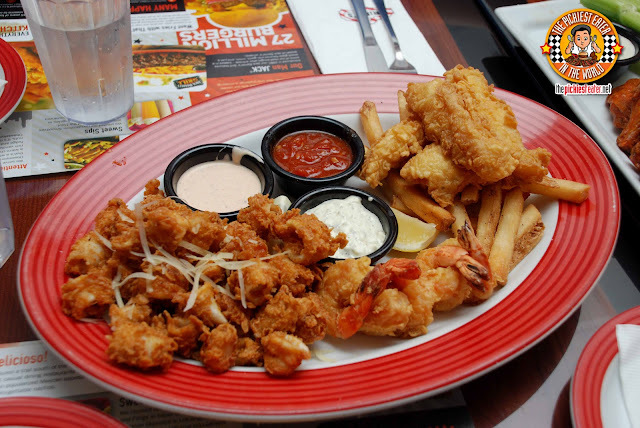 Much like the other seafood in the platter, it was covered in a light batter and fried to a nice crisp.. Though I ate a small piece with the tartar sauce, the waiter suggested I try it with the cocktail sauce, however my hyper-acidity forbade me from doing so (Didn't want to risk my tummy erupting during the middle of my meeting.. Might end up signing a contract in an effort to make it to the bathroom). 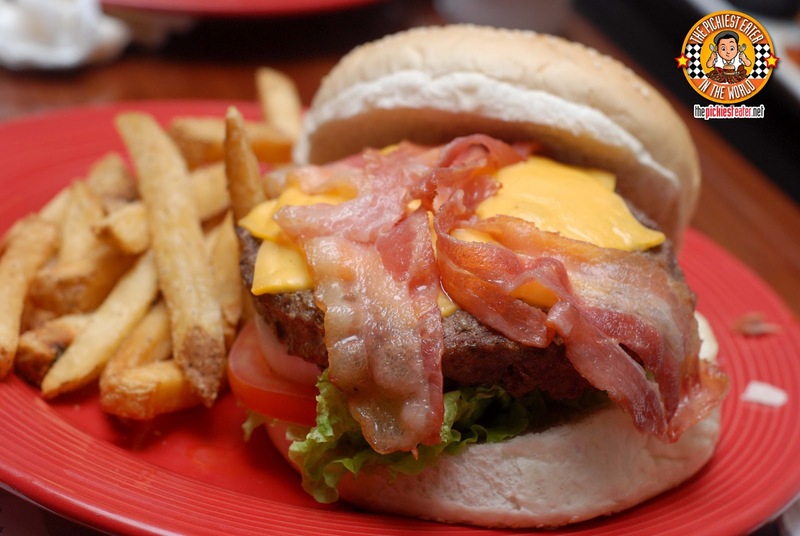 Despite what my trips to Village Tavern, The Stock Market Cafe, and most recently, Fridays may imply, I do not have quest to try every Bacon Cheeseburger created by The Bistro Group's restaurants. 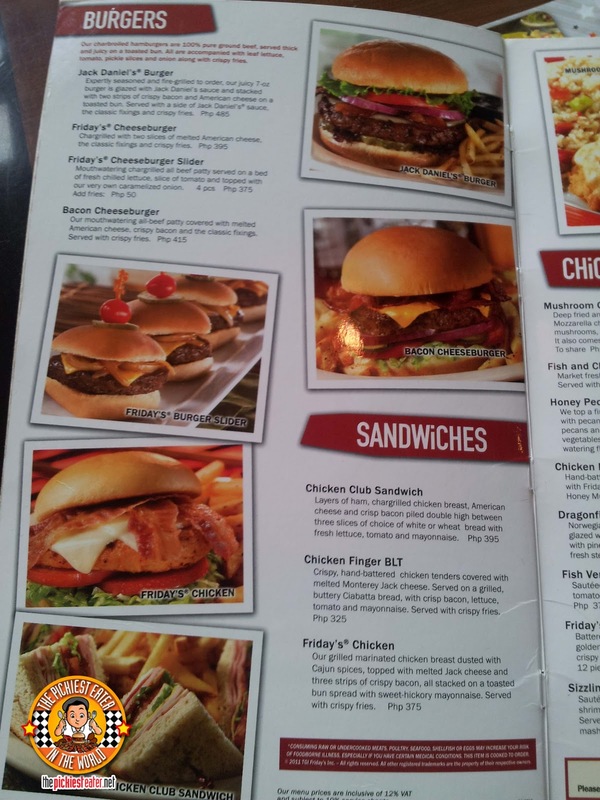 However I gotta admit, Friday's Bacon Cheeseburger (P395) is pretty awesome. Compared to Village Tavern's Cowboy Burger and The Stock Market Cafe's Ultimate Burger, Friday's Bacon Cheeseburger would seem a whole lot more simpler. However, by no means does that translate to a failure in flavor. Based on the meaty flavor of the All Beef Patty alone, you knew you were in for a good start. The patty was placed in between a soft, toasted, sesame seed bun, and on a bed of fresh lettuce, tomato, and onion (Yes, I removed the tomato). Two slices of American cheese are then placed on top of the patty whilst its still hot, blanketing the meat. The crown jewel of this burger was of course, the Bacon. Which may not have been cooked to a crisp (which i don't mind), but the flavor in itself was delicious, and was the perfect compliment to the burger. Because they were out of "Oreo Madness"we had the Mocha Mud Pie instead. 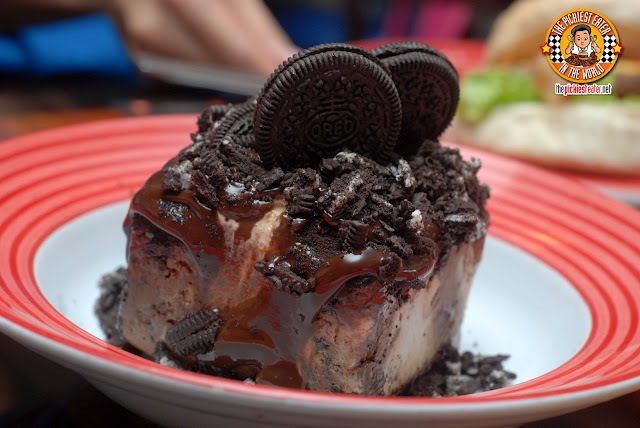 And since we were with the nice people of Oreo Philippines, the Friday's staff took the initiative and added a bit of Oreos, both whole and crumbled. The Mud Pie is Coffee ice cream with a chocolate crumb crust, and topped with chocolate syrup and almonds. The perfect way to end a meal. As I mentioned, I was selected to be in the running as Oreo's "Blogger Ambassadoreo". This was a huge honor, because out of the entire country, only three of us were selected, namely Yen Dreyfus of The Tummy Traveler, and Anton Diaz of Our Awesome Planet. If you've seen their blogs (which you probably have), you'll know that i'm up against some stiff competition! Nevertheless, my whole "Oreo" experience wasn't about winning or losing, it was about forming a bond with people on the strength of a cookie. Friends, family, and complete strangers from all over the world came together to help me out, and I thought that was absolutely amazing. but regardless, I had a blast making my entry! Oh and going back to T.G.I.Friday's, something I definitely would go back for are the ribs, and the Chicken Fingers!! Thanks so much Food Blog lurker! oh and thank you for introducing me to Hello Balloon! I've only read a couple of posts, and I agree! It's very entertaining! Kumpareng Anton in The Pickiest Eater? haha kwenento nya sa akin lahat ng kalokohan mo! hehe kidding! yes the mozzarella stick, chix fingers and sliders!